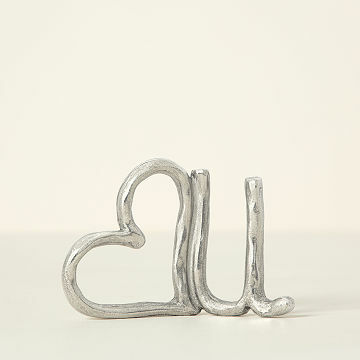 This pewter ring holder and desktop sculpture reminds them they're cared for every day. The little things remind us that we're loved: a hug, a note, a piece of jewelry. Let them know you care with this unique sculpture and ring holder. Tamara Hensick crafts the sentimental design from solid pewter. It serves as both a storage piece and work of art on their desktop or vanity. Send it to a jewelry lover or just the one who has your heart. Handmade in California. Polish with a soft jewelers cloth. Perfect on the kitchen counter while cooking! I love this ring holder on the kitchen counter while I am baking, cooking, or doing dishes. I don't have to worry that my wedding rings will accidentally go flying into the sink or get a bunch of dough in them. It looks nice too, and takes little space, bonus! This is a unique ring holder. Great piece placed on my dresser. My wife loved it. She now has a place to keep her wedding and engagement rings that's safe. It's both stylish and functional. Very beautiful, simple piece of art!